MMA Fight Video of "Yusup Saadulaev vs. Hideo Tokoro" in a Bantamweight Tournament Reserve Bout @ DREAM: Fight for Japan! New Years Eve! 2011 in Saitama, Japan on December 30th, 2011. The UFC 141: Lesnar vs. Overeem post-fight press conference was the last piece of business to take care of after the action was over in the Octagon, in Las Vegas, Nevada, USA on Friday, Dec. 30th, 2011 and presser was on Sat. Dec. 31st/2011 after UFC 141 ended. MMA Full Fight Video of "Alistair 'The Reem' Overeem vs. Brock 'The Beast' Lesnar" in the Main Event Heavyweight Bout @ UFC 141: Lesnar vs. Overeem in Las Vegas, Nevada, USA, on Friday, December 30th, 2011. MMA Fight Video of "Nate Diaz vs. Donald 'Cowboy' Cerrone" in the Co-Main Event Lightweight Bout @ UFC 141: Lesnar vs. Overeem in Las Vegas, Nevada, USA, on Friday, December 30th, 2011. MMA Fight Video of "Junior Assunção vs. Ross Pearson" in a Featherweight Spike TV Prelim Bout @ UFC 141: Lesnar vs. Overeem in Las Vegas, Nevada, USA, on Friday, December 30th, 2011. MMA Fight Video of "Danny Castillo vs. Anthony Njokuani" in a free Lightweight Spike TV Prelim Bout @ UFC 141: Lesnar vs. Overeem in Las Vegas, Nevada, USA, on Friday, December 30th, 2011. MMA Fight Video of "Sean Pierson vs. Dong Hyun Kim" in a Welterweight free Facebook-Streamed Prelim Bout @ UFC 141: Lesnar vs. Overeem in Las Vegas, Nevada, USA, on Friday, December 30th, 2011. MMA Fight Video of "Jacob Volkmann vs. Efrain Escudero" in a Lightweight free Facebook-Streamed Prelim Bout @ UFC 141: Lesnar vs. Overeem in Las Vegas, Nevada, USA on Friday, December 30th, 2011. Watch the fighters from UFC 141: Lesnar vs. Overeem weigh-in from the MGM Grand Garden Arena in Las Vegas, Nevada, USA. Punk Payback with Bas Rutten S01E07 -- The shows premise is around the former UFC Heavyweight Champ and King of Pancrase breaking down real-life self-defense situations caught on camera, and showing viewers what to do if they were in that situation. 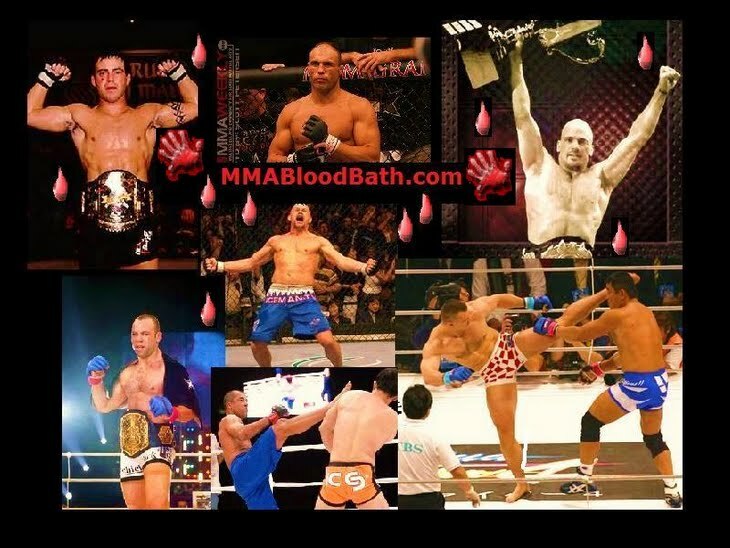 Monday, December 26, 2011 -- The year-end Bazzie Awards highlight the best fighters, knockouts, submissions, as Kenny Rice & Bas Rutten hand out MMA's most coveted prizes, the Bazzies. Thursday, December 22nd, 2011 -- ESPN's MMA Live takes a look back at Strikeforce: Melendez vs. Masvidal and counts down to UFC 141: Lesnar vs. Overeem. Punk Payback with Bas Rutten S01E06 -- The shows premise is around the former UFC Heavyweight Champ and King of Pancrase breaking down real-life self-defense situations caught on camera, and showing viewers what to do if they were in that situation. Monday, December 19th, 2011 -- GSP goes under the knife, but how long will he be out? Showdown Joe takes a look at upcoming events, and analyzes Brock Lesnar facing Alistair Overeem at UFC 141 in a very highly anticipated matchup. Monday, December 19th, 2011 -- UFC heavyweight Alistair Overeem previews his upcoming UFC 141 fight against Brock Lesnar. Plus, 2011 NCAA wrestling champion Anthony Robles discusses his success, despite being born with only one leg, with Kenny Rice and Bas Rutten. Also on the panel, UFC heavyweight Cheick Kongo and world renowned trainer Greg Jackson. Ron Kruck's medical report on a brain injury study in Nevada. MMA Fight Video of "Alexander Shlemenko vs. Julio Paulino" in the Main Event Middleweight Bout @ Far East Federation of Modern PANKRATION (Pankration MMA): Battle of Empires in Khabarovsk, Russia, on December 17th, 2011. MMA Fight Video of "Ricco Rodriguez vs. Bashir Yamilkhanov" in the Co-Main Event Heavyweight Bout @ Far East Federation of Modern PANKRATION (Pankration MMA): Battle of Empires in Khabarovsk, Russia, on December 17th, 2011. MMA Fight Video of "Gilbert Melendez vs. Jorge Masvidal" in the Main Event Lightweight Championship Bout @ Strikeforce: Melendez vs. Masvidal in San Diego, California, USA, on Saturday, December 17th, 2011. MMA Fight Video of "OSP - Ovince St. Preux vs. Gegard 'The Dreamcatcher" Mousasi" in a Main Card Light Heavyweight Bout @ Strikeforce: Melendez vs. Masvidal in San Diego, California, USA, on Sat. December 17th, 2011. Boxing Fight Video of "Carl Froch vs. Andre Ward" is the Super Six World Boxing Classic Final championship fight for the WBC & WBA (Super), & vacant The Ring super middleweight titles. The bout was held Sat. December 17th, 2011, at the Boardwalk Hall in Atlantic City, New Jersey, United States (USA) and was televised on Showtime. Friday, December 16th, 2011 -- Joe Rogan on Fear Factor returning to NBC with bigger and grosser challenges, and on doing stand-up comedy. Below are the results of Friday’s official weigh-in for Strikeforce: Melendez vs. Masvidal, airing Saturday, December 17 at 10:30 pm ET/PT on Showtime. The event is headlined by the Strikeforce lightweight title fight between Gilbert Melendez and Jorge Masvidal. "MMA Live" sits down with UFC light heavyweight Champion Jon Jones to discuss his status as MMA's pound-for-pound best, and what we can expect in 2012. Also, ESPN.com/mma blogger Chad Dundas talks Gilbert Melendez, Alistair Overeem and more. MMA Fight Video of "Jens Pulver vs. Timothy Elliot" in the Main Event Bout @ RFA - Resurrection Fighting Alliance 1 in Kearney, Nebraska, USA, on December 16th, 2011. MMA Fight Video of "Bob Sapp vs. Maro Perak" in the Main Event Heavyweight Championship Bout @ Noc Gladijatora 6 in Dubrovnik, Croatia, on December 16th, 2011. Extended Preview from the UFC 141 Countdown (10 Mins) -- It's "the perfect matchup" as power wrestler Brock Lesnar faces unbelievable striker Alistair Overeem. Plus, two lightweights whose hearts beat bad blood meet in Nate Diaz vs. Donald 'Cowboy' Cerrone. On Sunday, December 11th, 2011, 46-year-old MMA old-schooler Don Frye competed in a Light heavyweight Championship Bout vs. Ruben "Warpath" Villareal at a Gladiator Challenge: Mega Stars in Lincoln, California, USA, making his first cage appearance since a one-minute TKO loss to Dave Herman in 2009. Middleweights Vitor 'THE PHENOM' Belfort and Wanderlei 'AXE MURDERER' Silva have been named upcoming coaches for "The Ultimate Fighter: Brazil," UFC president Dana White announced on Tuesday. White made the announcement during a news conference in Rio de Janeiro, Brazil to promote UFC 142, which is set for Jan. 12, 2012 at HSBC Arena. The UFC held a press conference today (Dec.13) for UFC 142: Rio. Just days after UFC 140, Dana White flew to Brazil to promote the organizations first show in 2012. UFC 142 is set to go down at the HSBC Arena in Rio de Janeiro, Brazil on January 14, 2012. In attendance was UFC President Dana White as well as main event fighters Jose Aldo and Chad Mendes, along with co-main eventers Vitor Belfort and Anthony Johnson. MMA Fight Video of "Denis Kang vs. Shung Oyama" in the Main Event Middleweight Tournament Quarterfinal Bout @ Road FC 5: Night of Champions in Seoul, South Korea, on December 3rd, 2011. The 2011 World Mixed Martial Arts Awards Event from the Pearl at the Palms Casino Resort in Las Vegas, Nevada, USA on November 30th, 2011 with host UFC Middleweight Contender Chael Sonnen.